Channels are the ways that you engage with your customers (how they create support requests and how you communicate with them). You choose and configure the channels you want to support. Regardless of the channel by which new support requests are submitted, all requests become tickets that agents manage in Zendesk Support. To set up channels, select Settings > Channels. The Zendesk Support email channel enables customers to send email directly to your support email address (for example, support@mycompany.zendesk.com). Email you receive for Zendesk Support becomes tickets. Your Zendesk Support account allows for an unlimited number of email addresses within your Zendesk domain. In other words, you can use as many email address variations as you need. Accepting support requests via external email addresses is also supported. If you already have, or want to support, external email addresses, you can forward email received at those addresses to equivalent addresses in your Zendesk domain. In addition to receiving support requests at your external email addresses and then forwarding that email to your Zendesk account, you can also configure your email channel to process all outgoing email as if it were coming from your own email domain, rather than your Zendesk account domain. Using your own domain requires a little more set up on your part, and much of it is done outside of Zendesk, maybe requiring help from your domain administrator. All of your email communication is sent using a template that you can customize. The template is in both HTML and plain text. You can customize the template to match your branding. You can also make some minor modifications to the wording. You can also set up Zendesk Support business rules to generate automatic email replies at each stage in the workflow, such as updating the ticket, solving the ticket, and so on. For more information about configuring your email channel, see Getting started with email in Zendesk Support. For information about enabling Guide and setting up your Help Center, see Getting started with Guide. The Zendesk Twitter channel enables you to monitor and respond to your Twitter community from Zendesk Support. You can monitor one or more Twitter accounts and convert tweets to tickets, called twickets. All tweet activity between agents and Twitter users is added as ticket comments. Tickets created from tweets are also referred to as twickets and you'll see that word used in our documentation as shorthand for 'tickets created via a tweet'. It's important to note however that once a tweet becomes a ticket it behaves just like any other ticket in Zendesk Support. The one exception to this is that you have a number of Twitter specific options for replying back to the Twitter user. You can reply with a tweet or your reply can be a direct message, which is a private message back to the user. For information about setting up your Twitter channel, see Setting up your Twitter channel. Zendesk Chat enables customers to initiate live chat with an agent. Chat sessions become tickets that agents can update after the chat session. 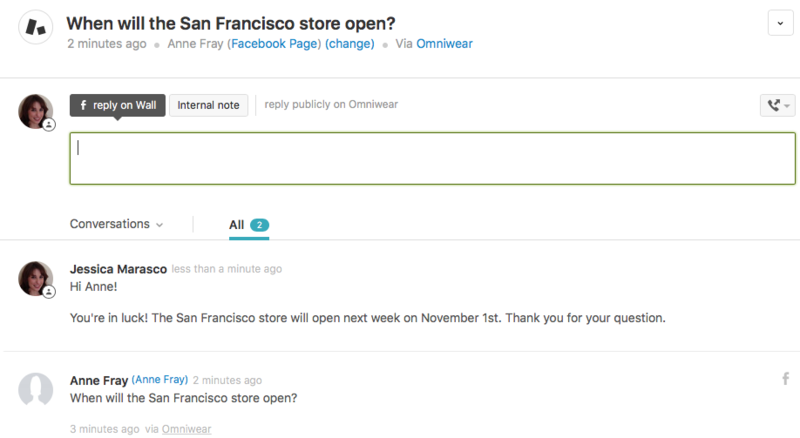 You can add Zendesk Chat to any website or Help Center. In addition to responding to end-user chats, you can review a real-time list of visitors, what page they're on, how they got to your website, and other details. Using this information, agents can provide proactive support by reaching out to targeted visitors, like ones with items in their shopping cart but are taking too long to complete their purchase. Agents can also chat with other agents, either one-on-one or by pulling them into a conversation with a visitor. For information about setting up Zendesk Chat, see Setting Up Zendesk Chat . For information about using chat, see Using Zendesk Chat . Tip: Fine tuning: Check out Audrey Griffith's new Fine tuning: Implementing Chat as a channel for more information on how you can maximize your chat support. 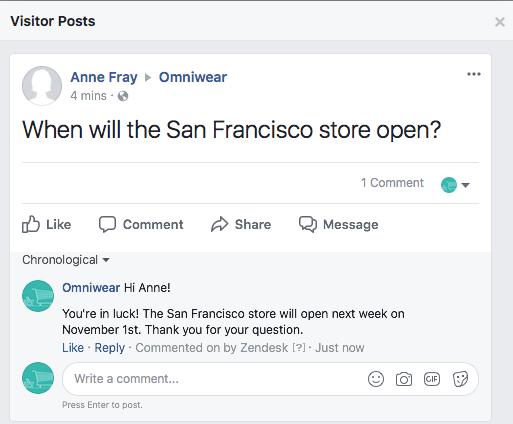 The Zendesk Facebook channel enables customers to make support requests using Facebook, and it enables your agents to see and respond to customer Wall (Timeline) posts and comments from within Zendesk Support. You can add up to 15 pages to your Support account. You have to be an administrator (or have appropriate role permissions) to set up the Facebook channel. When you add a Facebook Page to your Facebook channel, your Zendesk monitors that Page. So users make Wall posts on that Page as they normally do. And each Wall post automatically becomes a Zendesk Support ticket. When a user adds a Wall post on your Facebook page, that user becomes a new user in your Zendesk Support and the Wall post becomes a new ticket. You can set up a Facebook view if you want to see all your Facebook tickets in one place. Any new comments to the Wall post are added to the ticket as additional comments. Agents can respond directly to a Wall post by adding a public comment to the Zendesk Support ticket. The comment will also appear on the associated Facebook Wall post. In addition to Wall posts, any private messages sent to the Facebook Page become support tickets. This means that a user can ask a private question, and an agent can have a one-on-one conversation with the user. Users click the Message button on your Facebook Page to send a private message. For information about setting up your Facebook channel, see Setting up your Facebook channel. The Zendesk Talk channel integrates live telephone support into your Zendesk account. You select a telephone number for incoming calls and set the call queuing options and recorded greetings. You can also customize call greetings. Agents make themselves available to receive calls and their conversations with customers are recorded and added to tickets. When agents are unavailable, customers leave voicemail messages that automatically become tickets containing the voicemail recording and a transcription. Agents can answer calls through the web browser or they can forward calls to another number. For information about setting up your Talk channel, see Enabling the Talk channel and configuring general settings. For information about using Talk, see Using Zendesk Talk. The Zendesk Text channel is included with Talk Team, Professional and Enterprise. Text enables you to respond to inbound text messages, automate alerts, or send proactive texts to your customers. Whenever you receive a text, it automatically creates a ticket in Support meaning that you can apply all of the advantages of automated workflows, reporting and history to your text support. For information about setting up Text, see Getting started with Text. The widget appears in the bottom-right corner of your website or Help Center, and your customers click the widget to access support options. You configure the components you want in the widget, then add the widget code to your website or Help Center. After you add the code, you manage changes from your Zendesk. You must be an administrator to set up and manage Web Widget. If you're a developer, you can access Zendesk Support functionality through the Zendesk API. For example, you can create a new ticket using the API instead. The Channel > API page in Zendesk Support lets you configure how API requests are authenticated as well as track API activity against your rate limit. For more information, see Using the API dashboard. After the SDK is integrated in your app, changes are managed from your Zendesk and automatically reflected in the SDK. Adding the SDK to your app is done outside of Zendesk by your developers using a code snippet generated in Zendesk. As well as the channels that are built into Zendesk products, you can also add apps that offer additional channels by connecting to many popular platforms on the web. These apps let your agents respond to messages, reviews and comments just like they do with any other ticket. Remember, you can also use the Zendesk APIs and the Mobile SDK to create your own channels. To browse the available channel integrations, see the Channels section in the Zendesk Marketplace. We've recently discovered that our 'Support' tab wasn't linked properly to our Knowledge Base. When looking at 'Tickets by Channel' it reports that about 40% of our traffic comes from 'Web Service'. Does the web service refer to this tab? Or from a different source? As you'll see in Emily's post above (which you may have missed), Web Service refers to tickets that are created via the API. Are you using the old Feedback Tab, or the new Web Widget? We were using the Feedback tab, we've just disabled it and are looking into the Web Widget now. Using some of the other articles on your knowledge base I was able to determine the volume that came in through the feedback tab and it wasn't as drastic as we suspected. I am still curious what category both the feedback tab and the web widget would fall under. I'm still waiting to hear back on the Feedback tab; I haven't dealt with that one in a while so I don't remember whether it's considered Web Service, or Web Form. I'll let you know what I find out on that one. The Web Widget, however, actually shows up as it's own channel in Insights, so there won't be any ambiguity there in terms of being able to tell where your tickets are coming from. I checked with some colleagues and the Feedback tab would show up in Insights as "Dropbox". Have you released an update to treat the two web forms differently in the past year and a half? We are doing a campaign to move away from email and toward a standardize form (the ZD form) and want to know how successful we are. However, agents also create tickets for things through the agent interface....not part of the campaign. 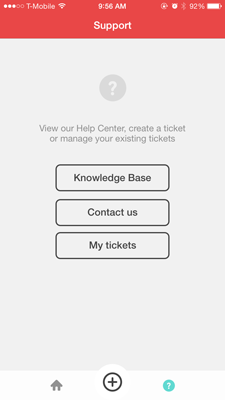 We've made a number of different changes to the Help Center structure in the last year and a half, and some of those changes do include the ticket form. Sadly I'm not entirely sure which two different web forms you're referring to in your question though. Mind elaborating a bit more here, or submitting a ticket to us at support@zendesk.com with some additional details on what you're looking for? Additionally, agents have not lost their ability to create tickets through the agent interface. So if that is part of your desired workflow, feel safe that it will not change any time soon. Is there a way to differentiate between different email address when making triggers? I want to set up a new email channel and I want all of those emails to go to a specific agent. You just need to add the new email to your Support Addresses first, and then refresh your browser. Then the new email address will show up in the condition drop down list. Hi. Question regarding web widget. Does Zendesk have any solution for visual feedback directly on the webpage the customers use. (eg like DebugMe, BugHerd)? This is not something that is currently offered. I did some research to see if there are any apps that do what you're asking, but it doesn't look like there are at this time. I'd suggest that you head over to Product Feedback and submit your detailed use case, and then other users can add their vote for it as well if it's something they would find useful. what is the difference between Web service and Web form? Web service relates to tickets created by a third party service, such as an app. Web form is your contact form. what is the difference between web form and web widget? The web form channel is the Submit A Request form in your Help Center. It's also used for tickets that are created by Agents from the agent interface. The web widget is a widget you can embed in a website. Support requests submitted through this widget show a channel of web widget. is it possible to manage more than 15 FB pages? 15 FB pages is currently the maximum number you can manage from your Support instance.